Um, yep… alright…. that’s the way I want my kitchen to feel. 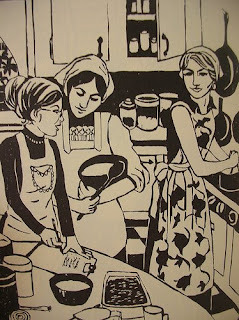 The women in aprons but still wearing jeans (usually bell bottoms… yes please! ), the cast iron cookware up on the wall, and the bins of healthy flours and dried beans on the counter, the cupboards filled with ball jars of goodness they have put away for winter…. 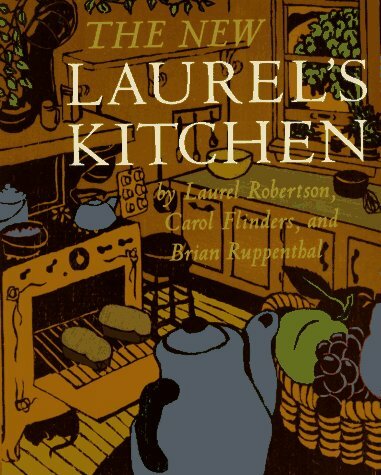 I didn’t think of myself as a 1970’s girl (being born at the tail end of the 70’s and my only feelings about the era being the memories of handmade corduroy clothing and the distinct loathing for everything carob) but through all these various conversations about the style of my kitchen I realize that these books… the ones that talk about keeping the beauty of the domestic role when the whole world had turned upside-down… that is the feel of my kitchen. Now my mother cooked from scratch. 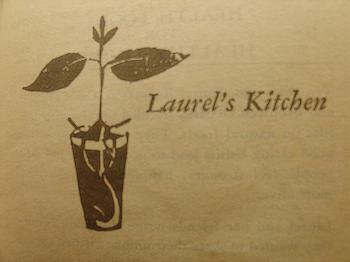 She bought food locally and for a long time at a co-op that always smelled of beeswax and hemp. We had chickens and goats and even a few ducks for a while when I was growing up, right in the middle of the states capital city. Many of the glass jars I have in my kitchen (esp the big ones at the bottom of my pantry) are older than me and have been holding oatmeal and corn flour for as long as I can remember. My mother was part of this movement. 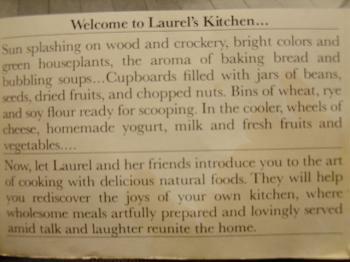 And as I read this bio for Laurel’s Kitchen…. I realize that I am too. The pictues are so inspiring. The first sentence and second paragraph definitely feel like my kitchen. I love the prints! Did you get a copy of the book, or is it online? I can picture some prints like that hanging up in my non-era specific vintage kitchen. Not to mention Goodwill - pretty easy to find one there. If you want to cut prints out for matting, the hardbound version was physically the biggest.